There is a UFO at the bottom of the Baltic Sea — maybe. 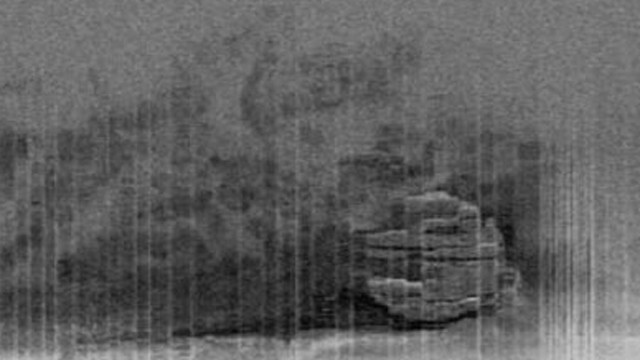 Sonar has located a curious disk-shaped object on the floor of the Baltic Sea, between Sweden and Finland. Enthusiastic treasure hunters and UFO buffs say it looks like the Millennium Falcon from Star Wars. (I think it looks more like Pac Man.) It’s about 200 feet in diameter and lies at the end of a churned up track of sea floor. No one knows for sure what it is, and the speculation is that it might be a Russian spacecraft or a UFO. The discoverers don’t think they can get investors to underwrite exploration of the object, because there is no promise of lost gold or silver. So, they’re hoping a TV production company will shell out for a Geraldo Rivera-type expedition to find out what the object is. Of course, in all likelihood the result would be as disappointing as the show where Geraldo opened an old safe and didn’t find anything of note. It’s wildly improbable, and it sounds like a trite and fantastic science fiction plot — but let your mind wander for a moment, and imagine the reaction in the world if we discovered a spacecraft burrowed in the silty bottom of the Baltic Sea. I just finished the last volume of Stieg Larsson’s trilogy, and I have mixed feelings about them. I thought the initial book, The Girl With The Dragon Tattoo, was excellent. I liked the second volume, The Girl Who Played With Fire, although I thought it was not as strong as the first book. I also thought the last volume — The Girl Who Kicked The Hornet’s Nest — was the weakest of the three. I liked the first volume because it was deliberate in its pace and different in its approach to storytelling. It took a while to get into the story, and the author didn’t seem to care that he was taking his time introducing you to characters, major and minor, and giving you their back stories. The character of Lisbeth Salander was fresh and different, the bit-by-bit relating of the horrible incidents and tragedies in her life was like finding successive clues on a treasure hunt, and the overarching tale of the redemption of journalist Mikael Blomkvist and his discovery of the secrets of the Vanger family, with the eventual assistance of Salander, was an interesting plot line. In the first book, although both Salander and Blomkvist have unique talents — as a computer hacker and reporter, respectively — their characters are believable and their actions and accomplishments are within the range of possibility. And I liked how the telling of the engrossing story also helped me learn a bit about Sweden and its history and culture. Unfortunately, as the story progressed through the second and third books it became increasingly unbelievable and, as a result, much less interesting. Lisbeth Salander somehow acquires the skills of a master spy and action hero who survives being shot in the head and buried alive. The middle-aged Blomkvist is revealed as a super-sleuth and awesome sexual athlete who apparently is irresistible to every woman he encounters and is able to fight off contract killers. By the middle of the third book, the story has become a pretty standard trial drama where the outcome is foreordained and the only question is when and how, inevitably, Salander will confront and defeat her equally superhuman but evil half-brother. I understand the buzz about Larsson’s books, and I applaud any series that has the mistreatment of women as one of its principal story lines. I do find myself wishing, however, that Larsson had stopped writing after the first book.